Seien Sie bereit für die Abholung hell und früh um 8:15 Uhr in Ihrem Hotel in Philipsburg. In einem komfortablen Tour-Fahrzeug, Transfer zum Dock Maarten, um an Bord Ihres Schiffes für den Tag, ein Katamaran mit einem aufmerksamen Kapitän und Crew besetzt. Finden Sie einen Platz auf den Decks oder in der Kabine des Catarmaran, dann genießen Sie die malerische einstündige Fahrt zum ersten Stopp, dem Naturschutzgebiet von Île Fourchue. Schnapp dir ein paar Snacks und nimm unterwegs eine Mimose, wenn du möchtest. Die zweite Station des Tages ist Gustavia, die Hauptstadt von St. Bart's. Hier befinden sich ein Fort und ein Museum aus dem 17. Jahrhundert, ein Hafen voller Megayachten und Straßen mit Geschäften und Restaurants. 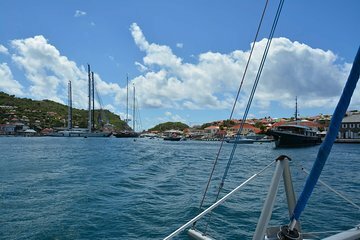 Abfahrt von Gustavia nach Colombier, wo Sie in der Sonne liegen, mit Meerestieren schwimmen und schnorcheln können, um die Unterwasserwelt zu erkunden. Mittagessen wird an Bord des Bootes serviert. Segeln Sie zurück nach Philipsburg, während Sie Champagner, Weintrauben und Bananenkuchen genießen, und landen Sie anschließend in Ihrem Hotel für den Rücktransport. There is nothing in the water. NO point in snorkeling just get drunk. My wife and I booked two catamaran tours and this was the second one. The first tour, on a competitor boat was extraordinary... I guess we were spoiled. The boat, Quality Time was OK, but after a day in the sun we kind of wanted to get a little shade and this boat didn't offer that. The snorkeling at ile Fourche was nice we skipped Columbier in lieu of more time at ile fourche. The food was OK, but not great. The snacks were OK, again but not great we got 5 grapes and a choice of a small piece of cake between my wife and I. The host and first mate were nice but just didn't compare with our fist tour they seemed to enjoy each other's company quite a bit. St. Barts is very beautiful but expensive. Waters were very rough getting there, bring something for sea sickness. On the way back we sailed home. St Barts was amazing. It reminds you of being in europe. Beautiful little island from what we seen, we had 2 hours to visit the island. Go to shell beach which is nearby its beautiful. But dont rent a chair at the little boutique hotel there its 55.00 a chair lol. You really dont have time to rent chairs anyway. The strip and stores were expensive so be prepared, but really nice. The captain and crew did an amazing job on this trip. My wife and I loved it, and it was one of our favorite parts of our vacation. Everyone did a wonderful job making sure all the guests were well cared for and having fun. Drinks were good and plentiful, snacks and lunch were delicious. They made paperwork in St. Barths easy, and were very good about communicating what needed to be done. As other reviews have said, the sea is a bit rough between St. Maarten and St. Barths, but the crew did a great job handling it and making the ride as comfortable as possible. I would take this trip again in a heartbeat. Great trip. Very rough seas on the way to St. Barts so keep that in mind. The crew were amazing, very tentative. 3 stops and plenty to eat and drink. Enjoyed it very much. Captain and crew were wonderful. Drinks and food were very good. trip was as advertised. Plan to book again when we go back next year. A great day out, but remember the sea sickness tablets if you are not a good sailor as the crossing to St Barths is very choppy. Crew very attentive and assisted those with problems and small children. Snorkelling at Ile Fourche very good. Nice walk round the shops in Gustavia before moving to Colombier for a lovely swim before lunch. Back to St Maarten under sail was far more relaxing. Pick up and drop off worked well. An excellent crew and boat with great service.